Transformative technologies will be on display at MT360 in Santa Clara, California, including augmented reality – the digital tool for manual work. Many manufacturers struggle to implement on-the-job training programs, as they necessarily draw skilled workers away from their tasks. It’s a major cost that some shop owners are not willing to incur, but what if they didn’t have to? What if a small device – a tablet perhaps – could walk new workers through the steps of repairing and setting up complex machinery, check their work and offer the advice of a veteran machinist? The same technology could enable a skilled engineer to assist with repairs off site or make quality control both faster and more accurate. This technology is on the cusp of seeing mainstream adoption, and most are only familiar with it through Pokemon Go. Augmented reality (AR) refers to any technology that uses digital images to assist in manual tasks. This may seem like a broad category, but the applications are very practical. Take the example of on-the-job training. Rather than dedicating a veteran team member to the training of a new hire, a shop owner can design an AR program to oversee, review and assist the hire in their duties. This training program can highlight objects and provide explanatory text and videos on the display screen, in addition to monitoring the hire for mistakes and alerting both the new worker and a supervisor of any detected problems. 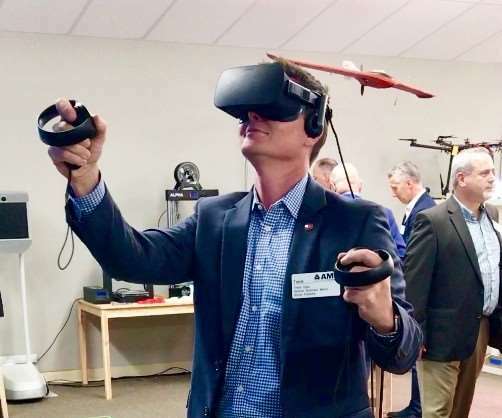 “The real benefit in AR-assisted training is that it eliminates a burden that is often placed on the more experienced personnel,” says Tim Shinbara, Vice President of Technology for the Association of Manufacturing Technology (AMT). “Instead of having the most productive workers in the shop step away from the line to train up-and-comers, the new worker is able to learn and grow into their role without slowing down production.” This significantly reduces the cost of training. Additionally, shop owners can design training modules to best fit their own needs, and the pace of training can scale to match the abilities of the trainee. And AR is not limited to training. Waiting for an OEM-licensed repairman may not be necessary if an AR-assisted repairman can identify problems and go through step-by-step repairs using his AR display. Quality assurance can be both faster and more accurate with AR devices identifying flaws in seconds, and assembling parts is simple thanks to step-by-step assistance from an AR device. It sounds a bit like science fiction, but the technology will be here faster than most think. For example, well known machine tool builder Makino is already actively engaged in using AR technology in a variety of ways. According to product marketing manager, David Ward, Makino service technicians are exploring the use of AR technology for remote diagnostic work, annotating an image to convey likely machine components to check or repair. At IMTS, the builder rolled out an iPad application that lets users see under the sheet metal of a machine tool. When the iPad camera sees an AR marker (similar to a QR code) on a machine, it displays a solid model of what the naked machine would look like from that angle, complete with animations of machine motion. The tool uses sensors within the iPad to track users’ motion and continuously update the “Xray” image as the user walks around the machine. Makino also has a markerless application the lets the user see what select machines would look like on the shop floor of a manufacture’s facility. Tim Shinbara says that AR is not a technology of the distant future. “Augmented reality is one of the most near-term and high-return technologies in manufacturing today.” This is why it is a major focus of the MT360 manufacturing event, which is designed to bring traditional manufacturers, non-traditional tech companies and venture capitalists into one conference, providing them with the opportunity to learn about transformative technologies that will intersect all three worlds. According to AMT President Doug Woods, “Transformative technologies are breaking barriers to entry for many companies unfamiliar with the world of manufacturing. MT360 is designed to bring traditional manufacturers and OEMs into contact with companies developing software and other innovations that will be crucial to getting the most out of these technologies.” The goal, according to AMT, is for the traditional manufacturers and tech companies to build relationships that enable them to create innovative manufacturing products, while venture-capital firms learn about the investment potential of these companies. From the world of AR, the event will feature companies involved in every aspect of the technology, including software companies that develop applications, hardware companies that produce digital screens, and complete AR-platform providers. The conference will explore these technologies through “tech garages” that show how different technologies can work together. The tech garages will showcase specific manufacturing challenges and demonstrate how these technologies can work together to create real, actionable solutions. When asked about the choice to include these technologies, Woods says that they represent a fundamental shift in the manufacturing ecosystem. Each of them not only drastically alters life on the factory floor, but also changes who is supplying the manufacturers. These are all new technologies that rely on advanced software, which brings new companies and influencers into the world of manufacturing. With MT360, AMT is hoping to assist these newer companies in the process of integrating into manufacturing. The MT360 event takes place June 18-20 in Santa Clara, California. Registration is open at mt360conference.com. All proceeds go towards supporting the MTConnect open technical standard for manufacturing. His Bosses Rejected His Idea. Then Hans Langer Became A Billionaire From His Plan For Giant 3D Printers.